At oneChurch.tv I have had the honor of getting to come in contact with a lot of different people and churches. It’s an amazing opportunity that God has given me! One of those people is a guy named Patrick Mayberry who is the worship leader at Forward Church Nashville. (for more about them go HERE) Patrick and I have known each other for quite some time now and I can tell you that I absolutely love this guy’s heart. He is super talented, but I can honestly say that he has an incredible heart for worship and leading people in worship. Recently Patrick’s Church recorded their first Album called All I Am! I have been so impressed with this album. It has 5 solid tracks on it and they are all next level. The songs were written and performed by Patrick and his team at Forward Church and they did a great job. This is an album that you want to have. 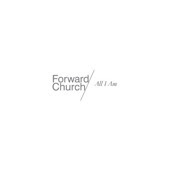 You can get it on iTunes by searching for Forward Church! The album only cost $4.95 and it goes to a great cause. (You can read about that HERE) So go now and listen to the preview. I have no doubt you will make the choice to support them. Patrick leads worship for me every week at oneChurch.tv for our student ministry. He does an incredible job. He would do a great job for any of you #stumin guys out there that need someone to lead a camp or retreat for you. I trust him with our environment every week and he hits it out of the park. He would do the same for you. I have no doubt! Here are 3 reasons I love using this dude! His Heart for Leading – Pat takes what he does super seriously and he should, but he has a unique gift for engaging students where they are! I have never heard him yell or use guilt but he will lead them where we are going if he has to. There is nothing I love more than when he backs away from the microphone to hear our Students singing with all their hearts! Organization – This is huge for me! I don’t know anything about music other than to say I like it or I don’t! I listen to enough worship to know if some thing is missing but rarely could I tell you what that might be. So it is super important to me that Pat be prepared every week and ready to go. Every week without fail he does. We have been together over a year and never once has he come through the door not ready to go. Says a lot about him. Talent – Pat is a phenomenal musician. Trust me. At oneChurch.tv the standard is high! Whether it is what his music brings to the set or it is his knack for leading a band to excellence he always hits it out of the park. He is super creative and never afraid to try something a little different. Patrick would do a great job for any of you looking for someone for camps or retreats. To follow him on FB or contact him you can go HERE!